Your wallet and your belly will love you. 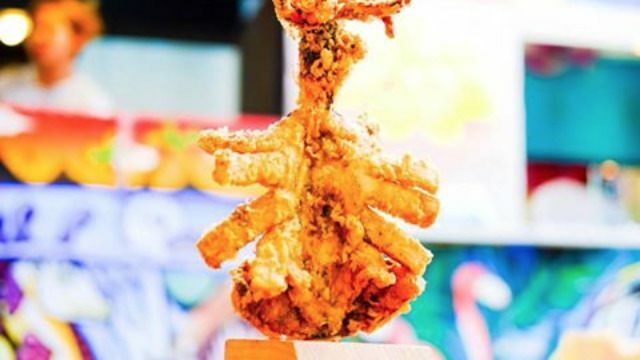 (SPOT.ph) Here's something anyone interested in the Pinoy food scene would know to be true: food parks are here to stay. Considering the trendy little hubs are convenient, diverse, and offer an increasingly unique dining experience, it’s no wonder more and more are cropping up all over the Metro. Of course, the best part about food parks isn’t the variety of cuisines or the accessibility of the location—it’s the affordable prices. So affordable, in fact, that your P200 can go a long way. Bacon holds a special place in many people’s hearts. What more so bacon that is slow-cooked, smoked, and cut down to about the size of a regular barbecue piece? 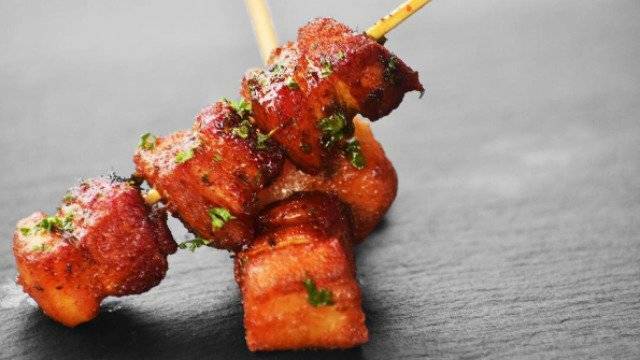 Only at P190 for a solo serving, the Killer Smoked Bacon Skewers comes with a signature Jalapeno jam. 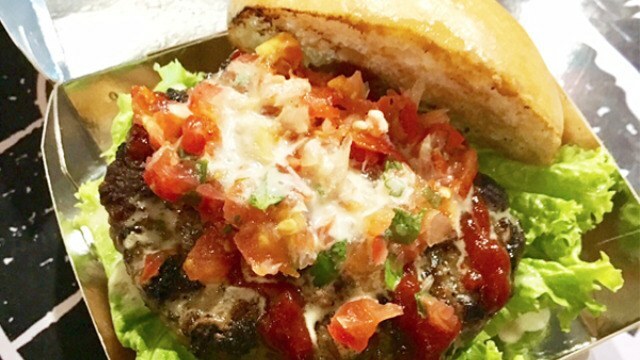 This eponymous burger from Burger Papi is worth the drive up to Cainta. Meaty with the right mix of spices, the pan-grilled patty rests on a bed of lettuce and sandwiched between toasted brioche buns. The P130-treat is topped with fresh salsa and garlic cream sauce. Above Sea Level’s Giant Butterfly Squid at StrEAT Maginhawa. 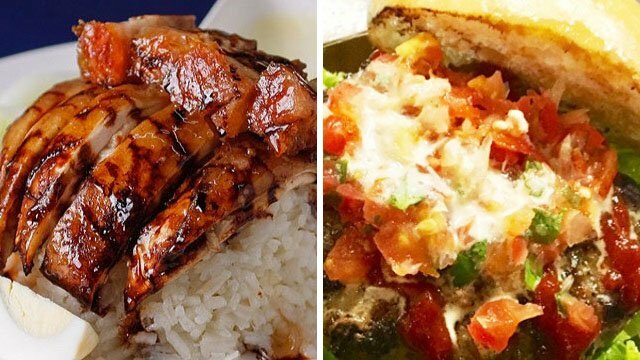 Maginhawa is already pretty much synonymous to food here in the Metro, and StrEAT Food Park in particular aims to live up to the street’s reputation. Challenge yourself with a Giant Butterfly Squid from Above Sea Level—you can enjoy all its fried and battered glory for only P180. It also comes with free java rice. If you’re looking for something lighter, Kantorini’s Mediterranean theme offers several choices, one of which is La Manitalia’s Classic Vegetable Pasta. 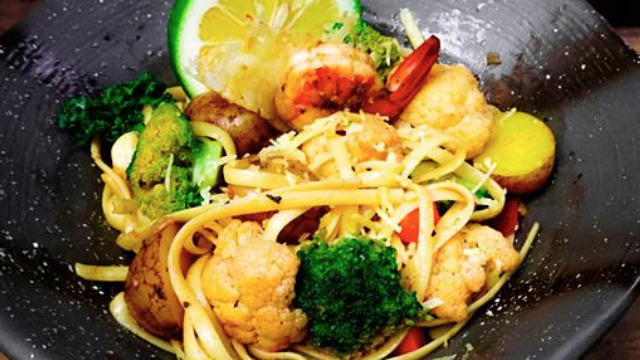 For P180, you get a dish of fettuccine pasta tossed with shrimps and fresh vegetables and served with garlic bread. Not bad for those looking to diet. Uncle Moe’s is an institution for hearty Persian dishes, and its stall at the Crave Park in Marikina does not disappoint. 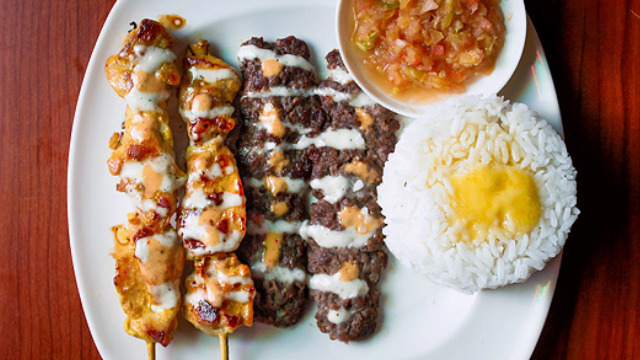 The classic Kebab Platter, a sulit choice for P155, gets you two sticks of chicken kebab and two sticks of beef kebab with the signature white sauce and rice. For a filling dinner up north, the Vibe Gastrohub has you covered. 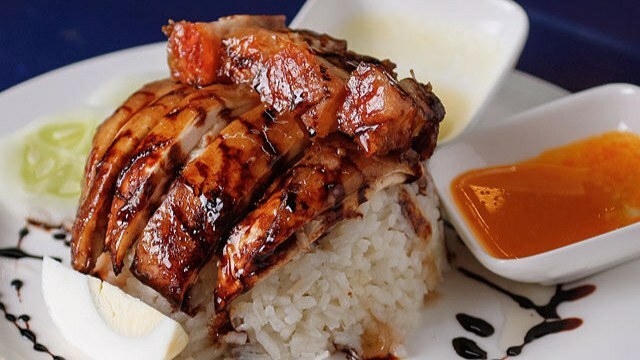 Its diverse mix of cuisines assures a favorite for everyone, but we most recommended Gee Jay’s Pork and Chicken Mix Hainanese Rice Set, which costs only P155. The chicken and pork complement the chicken-broth flavored rice, while the side of garlic adds new flavors to the mix. Worthy Korean cuisine is always a treat, and it’s even more special when it comes in an affordable plate. 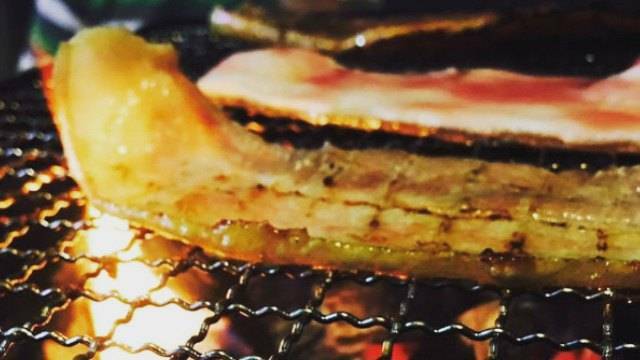 Adventure Food Park on Aurora Boulevard is home to Harojisihi’s samgyupsal, and you can indulge in a solo platter for only P125. The Boxyard may not be as decorated as the rest of the food parks on this list, but it certainly makes up for it with its upbeat ambience. 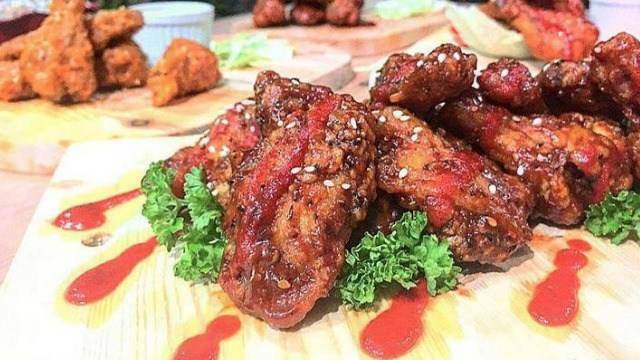 The Flames and Wings’ Spicy Chicken Wings, P159, can be enjoyed right in the comfort of this neighborhood food hub. Considered classic bar chow, this dish is best paired with a cold drink. 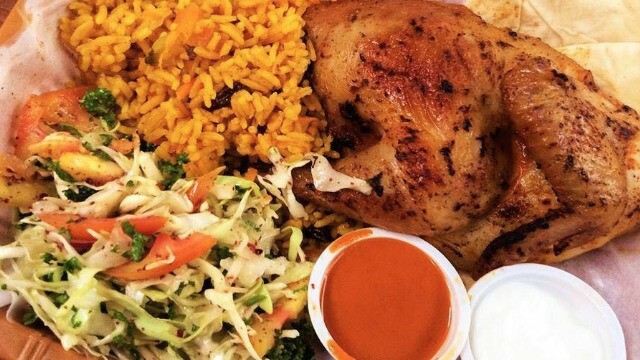 Meshwe’s Lebanese shawarma has admirers far and wide, but another gem from Z Compound that you should check out is the Quarter Chicken Farouj. A filling dish that you can get served with rice or fries with green salad, it will only set you back P170. 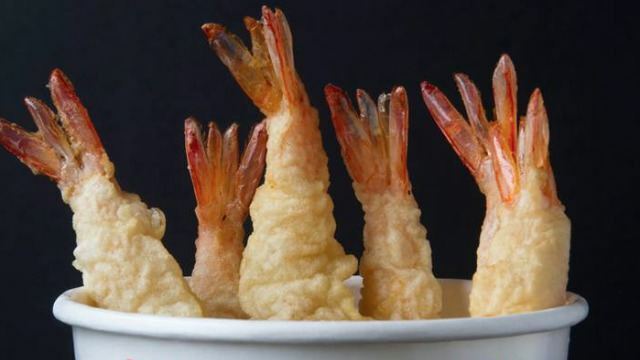 There are a few things that would guarantee a draw and unlimited shrimp tempura is one of those things. Tokyo Tempura at CommunEATy makes sure that it’s worth your while too, with battered shrimps in a handy bucket, all for P199. 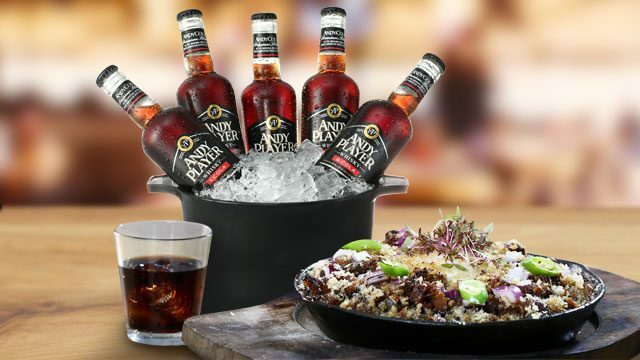 Of course, all these food choices are best enjoyed with a cold one, particularly something that goes down smooth like Andy Player Whisky & Cola. Its swabe taste and refreshing kick will serve you well on all your food park adventures, which are never complete without the pre-requisites: good food, great drink, and amazing company. Follow Andy Cola on Facebook for updates on their latest promos.